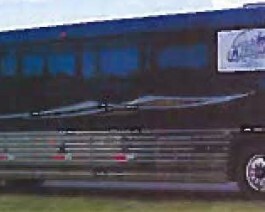 The bus is owned and operated by the Yellowstone Quake, Inc., a 501 c 3 not-for-profit organization. It has seating for 42 people, a restroom, ample overhead storage, air conditioning, comfortable tilt-back seats with plenty of leg room, ample storage and professional drivers. For more information call Kevin Johnson (307) 250-1125 or Heather Christensen (307) 272-6920. If you’re planning an activity that requires moving folks around, here is the vehicle!